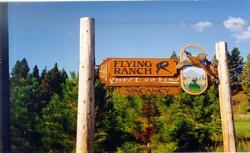 Flying R Guest Cabins - located in Montana's Bitterroot Valley - on your way to and from Yellowstone and Glacier Parks. Relax, refresh, and rejuvenate at the Flying R, where our guest cabins comfortably accommodate up to four people. Trapper Peak, the highest peak in the Bitterroot Selway wilderness area, along with the Chaffin Creek drainage, dominate our serene vistas. Our cabins feature a complete kitchen, which we can stock with all your favorites prior to arrival. Sleeping quarters include a queen bed in the loft and a double futon in the living area. Full baths and a sunset deck complete your cozy abode. Whether your pleasure is hiking, biking, skiing, fishing, boating, horseback riding, hunting, or a quiet walk in a serene Montana setting, we can accommodate you at the Flying R. Our 100-acre ranch borders miles of Forest Service trails. We are only twenty miles from Lost Trail Powder Mountain, a quick drive to Painted Rocks and Lake Como Recreation areas, and minutes from the West Fork of the Bitterroot River. For your special getaway, try the Flying R.
Directions: Flying R Guest Cabins are located approximately six miles south of Darby, Montana, in the Bitterroot Valley of southwestern Montana. Take route 473 West off Highway 93. Travel 1.8 miles to Flying R entrance.